A frequent flyer program is at its most basic, a loyalty program designed to reward those who continue to fly with one airline or partnership of airlines. The hook they use to get you in is the offer of rewards, such as free flights, upgrades to business or first class, and other free items and services. In Australia, there are two main Frequent Flyer programs, operated by the two main airlines. Qantas operate the larger program – Qantas Frequent Flyer. This program, which has over 10 million members has a number of partners including Jetstar, Emirates, American Airlines, British Airlines and Cathay Pacific. Velocity Frequent Flyer is the program of Virgin Australia. This is a smaller and growing program, offering its own unique set of benefits. After that, there are numerous programs operates by a number of airlines that have their own unique beneifts. At the most basic level, members of these programs earn points (or miles) for each flight they travel on. These points accumulate can then be redeemed for various rewards. On top of the points gained for flying, programs have expanded into many other areas, allowing the earning of points for many day to day activities. There are ways of earning points while shopping, filling the car up with petrol, using a credit card and so on. Bonus frequent flyer point earn rates. The higher your membeship level, the higher the bonus. This may raise as high as a 100% binus at the top tier. Each airline stuctures it benefits differently, and may not include all of the above benefits, or may provide different benefits. Individual airlines can’t be every and do everything. As a result, most airlines have partnerships or are members of an alliance. Depedning on the partnership, you may be able to leverage some of the benefit of your ‘home’ program while using the services of another airline. The oneWorld alliance is the alliance that Qantas is a member of, and this is relevant to many Australian flyers. The alliance consists of 15 members, including the likes of Amercian Airlines, British Airways, Cathay Pacific and Malaysia Airlines. Star Alliance is the largest of the global alliances. It consists of 28 airlines, serving almost 200 countries. Airlines in the Star Alliance include Air New Zealand, Air Canada, Lufthansa, Thai Airways, and Singapore Airlines. 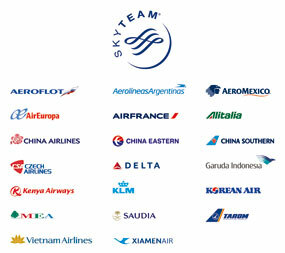 Skyteam is a smaller alliance and sees 15,000 daily flights and has airlines which fly to over 1,000 destinations in 178 countries. Example carriers include Air France, Alitalia, Delta Air Lines, China Southern and Korean Air. As each airlines has designed its frequent flyer program differently, it makes it difficult to directly compare the options that are available. However, it is possible to look at the major features of a program and decide based on what is important to you. When you sign up for frequent flyer programs, you usually fo so with some aime in mind. Something that is going to take some time, as you accumulate points in the program. It may take some time to save toward a rewards flight. One important issue that comes to light with this is that alomost all programs have some sort of expiry process on their points. Some programs take the model that points will expire at a fixed point after they are earned. For example, points may be expired 3 years after the are earned. If you know it will take you a while to earn enough points to get the rewards you want, then look for a program that either has no expiry, or one that allows you to extend the validity of your points. The Qantas and Virgin programs allow let you keep your points as long as your account stays active. As mentioned earlier, frequent flyer programs often have different membership tiers which depend on your flying patterns. As you move up the tier levels your ability to earn points increases and your benefit level may also increase. When comparing frequent flyer programs, you can make a judgement on how easy it is to move up the tiers and what you need to do to maintain your membership level. You should make this judgement based on your own flying patterns. Also take into account what each tier grants you in comparison to other programs. Most frequent flyer programs have a number of partners through which you can earn and, in some cases, redeem points. Possible partners include other airlines, linked credit cards, hotels, rental car companies, retail stores, or telecommunications companies. In general, the more partners a frequent flyer program has the more opportunity you will have to earn rewards points. Also look at the specific partners aligned with your program. One of the big earners from the various partnerships come from the credit card partners that a frequent flyer program has. Most frequent flyer programs have an option of a linked credit card from a partner provider, although in Australia you may not be able to find a card liked with some overseas based programs. These credit cards are a great way to earn frequent flyer points on your everyday purchases. Some frequent flyer programs offer more credit card options than other, so be sure to compare the available cards before you choose a program.